Snail mail is the best. Little (birthday) gifts for my mom. There is finally a bit of small gift making happening, and the last minute sending of a few remaining Christmas cards. It has been so nice to rest and relax a little these past couple days. It’s been an intense month – exhilarating and disorienting all at once. Feels amazing to wind down and enjoy some Christmas cheer. I appreciate this time of year as a chance to really consider the people that have touched my life, to show my appreciation toward others, and to slow down and enjoy the simplest of things. Today I’m looking forward to making eggnog lattes (oh my yum! ), wrapping some gifts, and hopefully dodging these heavy rain showers for a winter walk. It’s been stormy here lately, with a lot of wind and rain. The other day, on a very dark morning in the calm before the next storm, we sat drinking our coffee. 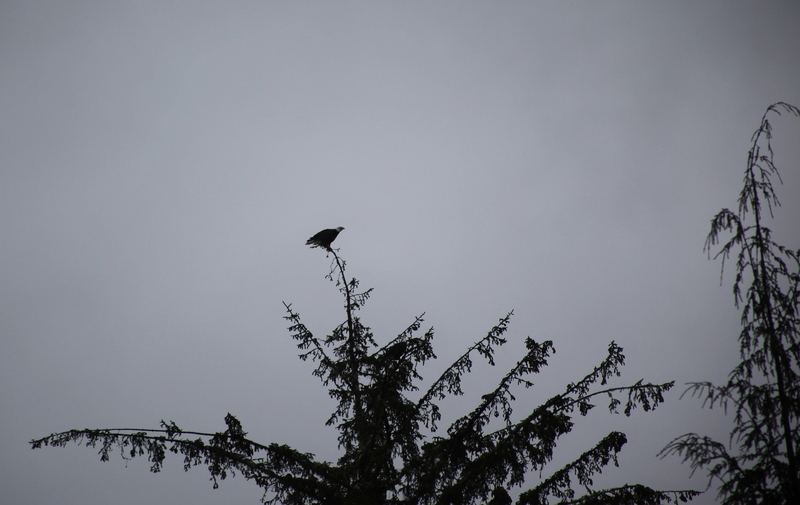 Steven commented on a bird in the top of a tree, and how it seemed just huge. Seemed way to big to be any of the usuals. 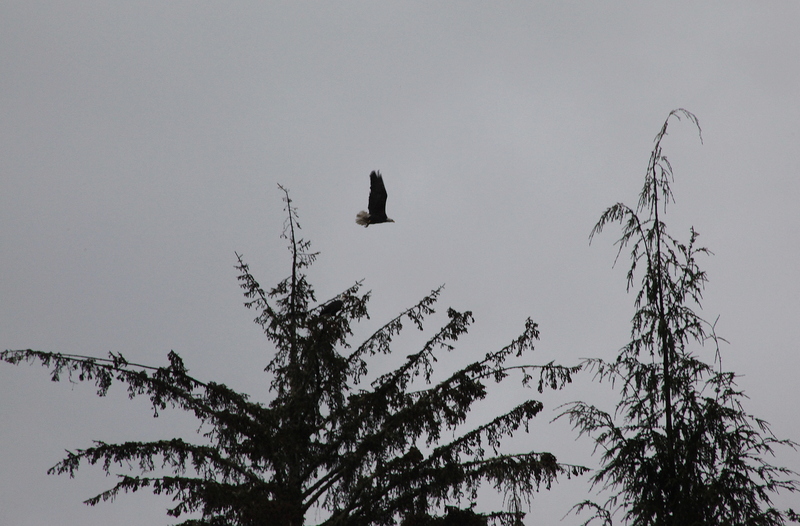 With a closer look in the binoculars I realized it was a bald eagle, and not only one, but 2. The second of the pair is below and slightly to the right. If you look closely you will see it. Amazing to see such large birds, and to observe the heightened state of all the smaller critters when these predators are nearby. 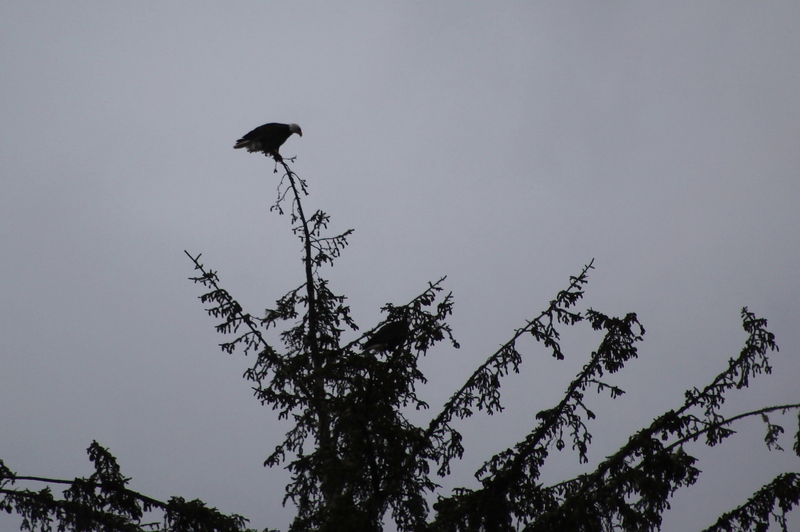 The eagle pair sat long enough for me to switch out to our telephoto lens and take a few shots. The photos are blurry in such low light, but we were happy to have been able to observe them for a time. I have been feeling a little extra sensitive these days, thinking about the state of things in the world, and how such a growing segment of people are sick, unhappy, and without the tools to cope with life. I am so grateful that I’m able to stay tucked in at home when I need to, but I worry about what’s happening to people and what this means for our future. How do we provide the tools needed for kids – and adults alike – to deal with what life throws at them? Why has there been such a breakdown here? What tools do you use when things get rough? What are your thoughts on this? For myself, I have the ever present resource of my own inner being. I am able, at any time, to go to the center of my being and draw on that stillness, that constant and steady light – the unique spark of life which has my signature. I feel that spark, in the vastness of a larger universe – something very real, and completely outside of the details that we humans can become consumed with. One needs to have a place of stillness to return to, when things become muddled and difficult. One needs to be in touch with that inner spark. It’s been a week full. A full week. :: A cozy corner. I should sit there more (I sit right across from there daily). :: Our beautiful handmade-in-the-Pacific NW wreath. A gift from our parents, who we love more than words could ever say. :: Stocked up on tights. I wear tights a lot in the winter. Love them. :: A little pile of wallets and clutch parts. :: Christmas cards… winter note cards. Remember that photo? And tea. And pomegranates! Mostly, I just wanted to drop in before a small eternity passed by. It’s a busy time, and my head is mostly buried in piles of fabric, and my clothes covered in little bits of thread. Feeling happy, a little restless, and quite excited for a bit of a break soon.